Double Eyelid White Eyeshadow Anyone? I still remember this look was the in thing when I was young. I first saw it in magazines then in movies. I remembered it until now. Basically the eyeshadow colour that they use is white, I tried doing it when I was young and it sucked big time I looked really really weird. The reason is when you use white as your eyeshadow it kinda makes your lids looks protruded instead of a normal lids with the colour white. I dunno if I am making any sense but now that I am smarter, older with more wrinkles and dead brain cells I figured out a way to make this makeup work. This technique is quite advanced, you need good blending skills and an angled brush to do it. First you have your brows, if you have the 88 pigment pallete you bought from me you can use shade 87 with an angled brush to do your brows. Then the brow bone is done using shade 1. 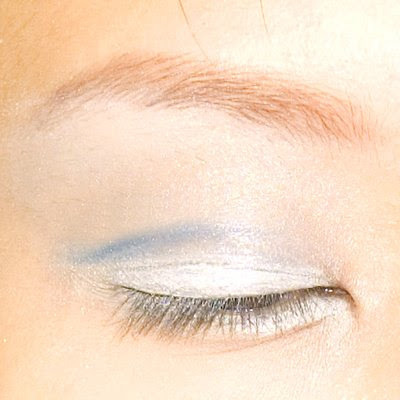 After that I used a silver colour which is Shade 11 and 22 together on my crease WITHOUT blending upwards. You can see the harsh line between the colours and my skin above. 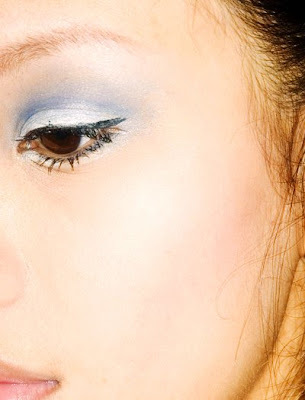 After that, I used my white eyeliner and line over my crease on top of the silver colour. I did my lower inner corner of my lash line too! This was the effect I got when I was young, it looks kinda weird doesn’t it. After that I used shade 44 which is something like a brown silverish colour right above the silver. I blend it up towards my brow bone and I STAY AWAY from my white and silver areas. Try not to brush over the previous areas. Next I used an angled brush and drew Shade 83 on my crease line ( you can go higher or lower, its up to you but basically when you open your eyes you should not be able to see the line at all, just a darker and deeper crease line) Its dark navy blue by the way. After that I used Shade 72 to blend from the blue line upwards carefully. Blend really well here until you get the effect like above when you open your eyes. Then I line my eyes using black eye liner. The line has to be as thin as possible so that it doesn’t cover the white areas. 80% of your crease should be white and the other 20% is your black eyeliner. 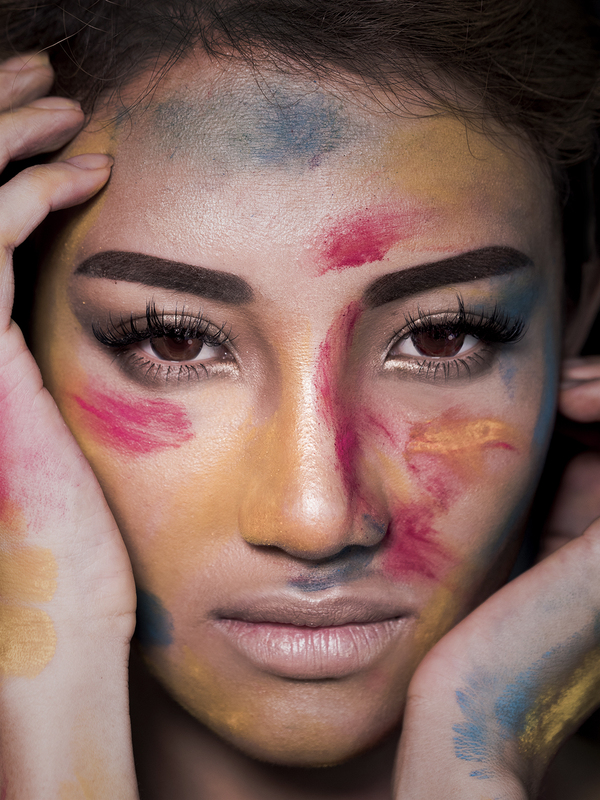 Due to the heavy usage of white on the eyes, you have to balance it on your cheeks by highlighting the area above your cheek bones with Shade 1 (white/light beige). Then you can blush your cheek areas. It looks like this with mascara and fake lashes on. For the lips, frosty pink or any other colour that suits the colour that you use on your eyes. The best thing bout this makeup is even though sometimes when you open your eyes real big and your crease disappears, this make up still keeps your double eyelid. Like in the photo above, you can still tell I have double eyelids. For single eyelid ladies you can also do this but your crease line have to be imaginary. Then you will get a double eyelid effect too! Sometimes when you get your colours wrong, your eyelid crease disappears under certain situations where you look down/ open your eyes too big. This makeup technique shows off your double eyelids nice and good!! You can always replace any of the colours I use.. as long as you have a really light colour on your crease. Geez.. this look is really nice! I have very thin double eyelids and I like to apply a darker shade to my crease to visually deepen it too! I must try this some time too!! what mascara do you use to coat your lower lashes? any tips for lower lash mascara application? You have amazing eyes. I have always wanted Caucasian eyelids… I suppose everyone likes what he does not have.